The International League of Peoples’ Struggle (ILPS) calls for the immediate release of five human rights activists working with Dalits, Adivasis and political prisoners in India who were arrested on June 6, 2018. Advocate Surendra Gadling, professor Shoma Sen and activist Mahesh Raut were taken from their homes in Nagpur. In a coordinated operation, the police also arrested activists Sudhir Dhawale in Mumbai and Rona Wilson in Delhi. They have been accused of being “top urban Maoist operatives” and have been charged under sections of the draconian Unlawful Activities (Prevention) Act or UAPA, which includes provisions to ensure long detention and makes it difficult to obtain bail. They appeared before a court in the city of Pune and have been placed in police custody until June 14. All five are outspoken, high profile activists: Adv Surendra Gadling is General Secretary of the Indian Association of People’s Lawyers; Prof Shoma Sen is Head of the Department of English at Nagpur University; Sudhir Dhawale is the Editor of Vidrohi Magazine; Rona Wilson is Public Relations Secretary Committee for the Release of Political Prisoners; and Mahesh Raut is an anti-displacement activist from Bharat Jan Andolan and former Fellow at the Prime Minister’s Rural Development (PMRD). The trumped up charges against the five are linked to an “Elgar Parishad” event held near the city of Pune on December 31, 2017 to pay respect on the 200th anniversary of a famous battle that pit Dalit troops against an army of Peshwar rulers known for enforcing rigid caste segregation. Organized by a coalition of 260 community organizations, the event brought together hundreds of thousands of Dalits and was followed by violent clashes on New Year’s Day incited by right-wing Hindutva leaders and thugs in which one Dalit was killed and several people injured. The five arrested are accused of spreading “hate speech” and even plotting to kill the Indian Prime Minister. In fact, the arrests are clearly an attempt to silence critical voices and draw attention away from the true Hindutva-linked instigators of the violent clashes, Milind Ekbote, head of the Hindu Ekta Manch, and Sambhaji Bhide, chief of the Shiv Pratishthan Hindustan. Both are linked to PM Narendra Modi’s ruling BJP party. Cases for inciting violence against Ekbote and Bhide were filed by police on January 3, 2018, but Ekbote was released on bail soon after being arrested and Bhide has not yet been arrested, despite a Supreme Court order demanding his arrest. This latest series of arrests are also clearly linked to the case of Delhi University Professor G.N. Saibaba, who is imprisoned for life, also for alleged links with Maoists. One of those arrested June 6, Adv Surendra Gadling, has previously faced constant harassment for handling Prof Saibaba’s case and was due to attend a hearing about Saibaba’s bail request on Friday, June 8. The only crime of GN Saibaba and the India 5 has been their consistent defense of the rights of Dalits, Adivasis and other exploited and oppressed masses in India and their opposition to the brutal Operation Green Hunt in Central India involving around 100,000 Indian military forces against the Adivasis and their allies, the Indian Maoists. 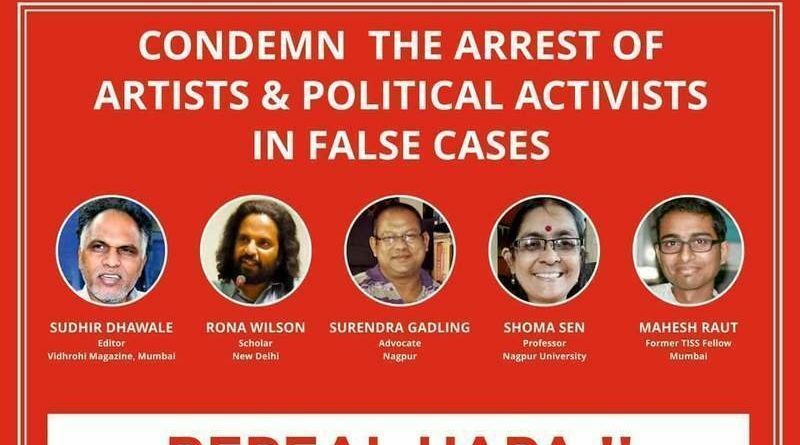 The ILPS calls for the immediate release of Adv Surendra Gadling, Prof Shoma Sen, Mahesh Raut, Sudhir Dhawale and Rona Wilson. We also repeat our call for the unconditional release of the wheelbound Prof Saibaba, who is presently in “excruciating pain… on the margins of life” in the notorious Nagpur prison, where his basic health needs are being denied, as well as all political prisoners in India.